Every year, thousands of newly designed Internet of Things (IoT) devices are released that do not have embedded security programming and make their owners vulnerable to cybercriminals. 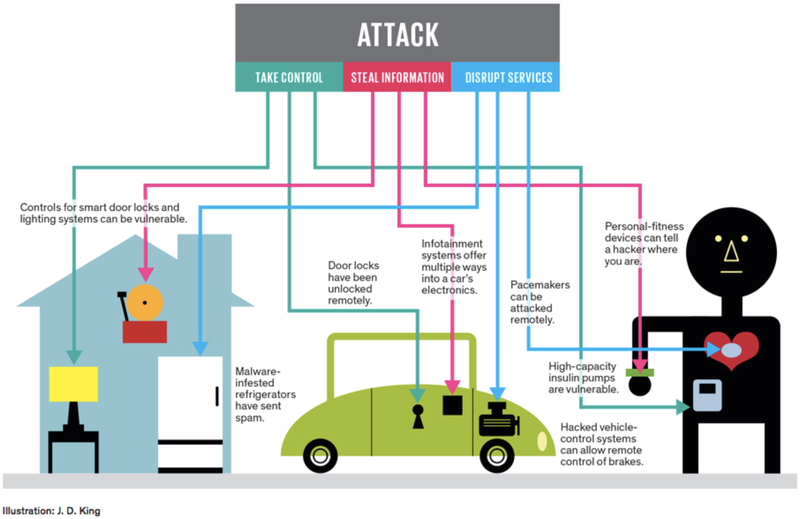 Consumers who ensure that all security precautions are in place across all their devices — phones, tablets, or even refrigerators or thermostats — reduce their risk of suffering an IoT-based cyber attack. IoT devices interact directly with each other, sharing data, providing insights and forming conclusions on your behalf. If you haven’t put proper security restrictions on those communications, however, your devices can leak your confidential information into the internet, open portals through which criminals can enter your home, and even give crooks power over your computer and other devices to use for their nefarious purposes. Some smart devices are programmed to transmit your data to their manufacturers about your usage. Others allow access to any digital presence without performing any pre-contact security scan. You can disable these features through your settings menu and while you are there, look for additional control opportunities that you can set according to your preferences and turn on the notifications for updates. Many home-based internet services require entry of a security code before allowing access to your internet service. If your system doesn’t require one yet, call your provider to learn how to have that protection turned on. If you do have that protection, be sure to change it away from the factory preset code. You might also be able to establish several network paths and use one for secure computing (with financial institutions, for example) and another for the connected devices. Some security software programs protect multiple devices, but most are not capable of protecting all your devices. Be sure to install the most current version of security software for each device and keep them updated over time. Using password-protected mobile equipment protects you from many unwanted intrusions. Keep in mind that apps also open vulnerabilities so disable the data-sharing programming within them too, if possible. The IoT offers amazing benefits. Properly protecting its part and pieces will ensure that you enjoy all those benefits without adding the risk of unwanted intrusions.